Journalist Johanne Hildebrandt, columnist Sakine Madon and reporter Annica Ögren starting a YouTube channel (Hildebrandt&Madon) to make room for new perspectives and voices which are not being heard by mainstream. In September they interviewed well known dynamic sportshooter Pia Clerté and Stockholm School of Economics researcher Erik Lakomaa regarding the Firearms Directive. EU’s weapons Directive wants to make it difficult for terrorists and criminals to obtain weapons. But in Sweden it hits hard only marksmen and hunters – law-abiding gun owners. Pia Clerté will not be able to practice her sport if the directive goes through. Researcher Erik Lakomaa says that politicians and officials are not guided by facts, and that the weapons criminals use are smuggled in from the Balkans. Sakine : After the terrorist attacks in Paris against, among others, the satire magazine Charlie Hebdo the European Union wanted to show that they took radical steps against terrorism. The question is indeed what the Firearms Directive will do. The directive has received heavy criticism from Swedish hunters, sport shooters and experts. Pia: For me as a sport shooter it is a disaster because I only use semi-automatic weapons when I shoot, both handgun and rifle and also shotgun. The way I understand the proposals for the directive that will soon be submitted for vote, it means my weapons will be banned. Erik: The parliament is involved, the council is involved, the commission is involved and regarding the central points of the matter, there is a very large aspect of uncertainty there can be very far stretching changes, or deteriorations as one maybe should state it from that point of view, for as an example Swedish hunters and sport shooters. This is not about which kind of weapon you use for which type of hunting, but this is about the principle of construction. A semi-automatic weapon is a weapon that after you have shot once, will automatically load a new round, then you can shoot again. While with a repeating rifle, which is the most common type, even if semi-automatics are getting more and more common, you will have to pull on the bolt handle to repeat in a new round before you can shoot again. So that is the difference in construction. This is a hunting rifle, manually repeating, so it will not be included in the firearms directive. This is a sport shooting rifle, an AR-, it is the weapon I compete with. It will be included in the firearms directive since it is a semi-automatic. This is a Kalashnikov, it is the kind of weapon criminals are keen to have. There are plenty to be found in the street for a few thousand Swedish crowns, smuggled in from the Balkan countries. When the firearms directive first came, it was just after the terrorist attacks in Paris and it was presented as, now we have found a solution that will solve all this… that will fight terrorism. But it doesn’t! All the firearms directive does is to make it more difficult for law abiding weapon owners to own these weapons. Terrorists, serious criminals they don’t care about it, they don’t have any weapon licenses. They will not be affected by any changes to the Firearms directive. We know that it is not our weapons that are used. Our weapons are not stolen and they are not used in any illegal situations, there is research that shows this. Erik: If you ask researchers, if you ask BRÅ (Counsel of crime prevention) there is a report from BRÅ recently where they interviewed police officers on the field, where these things are coming from, they tell you these are smuggled in weapons mainly from the Balkan. If the ambition is to limit the illegal use of weapons, and you base that on research, then you look at where the weapons come from. These are smuggled in stuff, so concentrate on stopping the smuggling. Johanne: So, why is this not done? Erik: Difficult to answer, it can of course be because it is more resource consuming, it can be more difficult to search through vehicles or to control borders and so on, than to implement new rules, even if you know the new rules are not going to have any effect at all on the subject. There is nothing to support another solution than cracking down on the entry. If they come from Yugoslavia, then you will have to stop it there, if you want to address the problem. Johanne: One of the arguments that the EU has used is that legal weapons are used in one thousand murders per year in the EU What do you say about that? Erik: It is easy to answer, that is not correct if you look at the European Union. The EU, the commission has stated this, that is correct, but it was criticized by other politicians, where did this number come from? So they gave a mission to a research group from Coventry. They found a number that corresponds to over one thousand. But, you need to know that they added 4 countries, Turkey, Macedonia, Serbia and Montenegro that are not part of EU, that together had 880 murders. If you look at Sweden where there are statistics… … and they also looked at one year, they picked the year with the latest available statistics, as the report says… in Sweden however, there is statistics over a longer time period, and it is about serious crime, where deadly violence is included, but also robbery, then in Sweden there is 1 to 2 cases per year. Johanne: But why are they pushing this then? Erik: You should not ask me about that, but in Sweden there is, and this has been the case over a long period now, the Police department that take care of the emissions of licenses has a theory that I would like to call the „hypothesis of leakage„. It builds on, and this they have written in reports to the Department of Justice and other instances that all illegal weapons have once been legal. Of course this is not true if you look at Sweden. You could state, a bit far stretched, that yes they were of course legal when they were put into the military supply in Yugoslavia, then they were stolen and smuggled into Sweden. But no normal person would call that a legal weapon. Of the existing versions, the wording as it is today, means that these weapons, the semi-automatic weapons that can take more than 20 rounds, so 21, will be banned. And that means that sport shooting, the dynamic sport shooting that I practice, will disappear. I am a law abiding citizen, I pay my taxes, I do what society expects of me in all circumstances, but I happen to like to practice my sport, sport shooting. Sport shooting, yes I need a weapon to do so. I need a semi-automatic weapon to be able to practice this sport. Why shouldn’t I be able to own a semi-automatic weapon? There is no reason. Sakine: Johanne, what a mess! Johanne: Yes, really. You can understand that Pia is angry. Sakine: Yes, I wrote a column earlier this summer about the firearms directive, and noticed that my inbox was filled with worried and angry emails. People don’t really know what is going to happen. 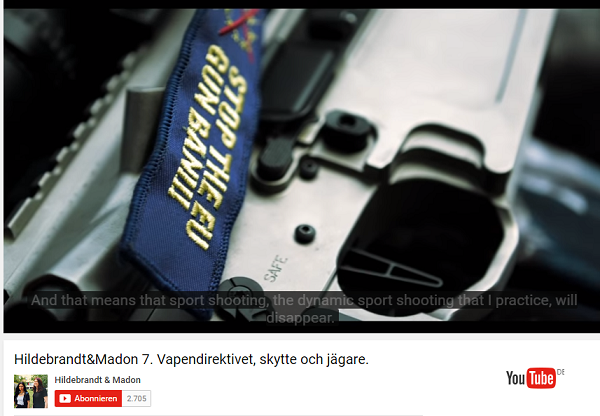 Many sport shooters and hunters consider that Swedish politicians and journalists do not really follow this issue well enough. Johanne: They are right actually, there are a lot of strange things, as for instance trying to stop terrorism and serious crime by impairing the conditions for sport shooters and hunters. The weapons the criminals are using come from the Balkan countries, they are smuggled into the country, shouldn’t the efforts be around stopping the smuggling rather than making life difficult for Pia and the hunters? Who has seen a bank being robbed with a hunting rifle? Sakine: Yes, symbol politics at its worst! Actually the Swedish parliament has taken the decision that the Swedish line of negotiations is that sport shooters and hunters should not be affected by the firearms directive, and still, nobody seems to know exactly what will happen. Johanne: No, they not even know how they should interpret the firearms directive, it seems like a terrible mess. Something tells me we will have reason to come back to this subject here in Hildebrandt&Madon. Both: Thanks for watching! Yes, thanks, and see you soon! FIREARMS UNTITED thanks Sakine & Johanne for this video. * = In September first reading was scheduled for 22th of November – a new date is not known yet. This lady has concisely shown the stupidity and wrongful targeting of the Commissions proposals. Target shooting sportsmen and hunters are not the suppliers of terrorists weapons.